Abstract: Data from the Mississippian tectono-stratigraphic units in the Tauride-Anatolide Platform, Central and Eastern Taurides, reveal that this region underwent incipient back-arc extension during the Variscan orogeny, but that rifting failed, leaving a basin floored with highly extended continental crust. The stratigraphy of several tectono-stratigraphic units, the Geyik Daği, Aladağ, and Bolkar Daği Units were studied in detail in the Sultan Daği and Hadim areas in the Central and Eastern Taurides. In the Sultan Dağ area, the Geyik Daği Unit contains shelf-type (shallow) marine clastics and carbonates of the Middle-Upper Mississippian Gökdere Member of the Harlak Formation, overlain by shales and basic volcanic/volcaniclastic rocks of the Kuz Member of the formation. The Mississippian age rocks in the Aladağ Unit around Hadim are characterized by quartzarenites and carbonates of coastal to shallow shelf environment. The Bolkar Daği Unit in the Hadim area includes inner shelf-type recrystallized limestones, dolomites and oolitic limestones. To the north of Konya, however, Middle Mississippian formations of the Bolkar Daği Unit include metamorphosed olistostromal deposits with Silurian–Upper Devonian olistoliths, which were generated in an extensional basin with back-arc type bimodal volcanism. In the Cataloturan Nappe of the Bolkar Daği Unit, in the Eastern Taurides, the Mississippian is represented by a basin/slope-toe- type succession with an alternation of lithic tuffs, radiolarian cherts and pelagic limestones. It grades into Upper Mississippian shallow-marine carbonates. 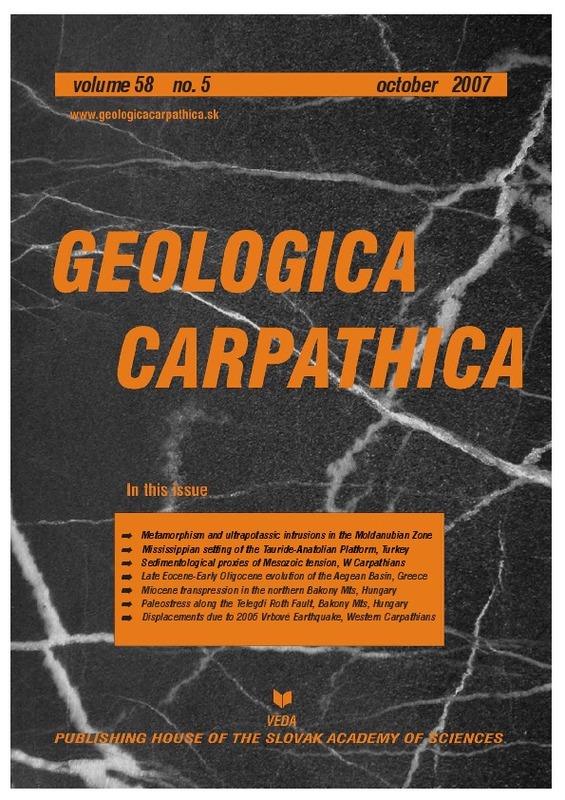 The data presented suggest the presence of a north-facing system with slope (Cataloturan) aborted rift basin (Konya-Bolkar Daği) inner shelf (Hadim-Bolkar Daği) coastal shelf (Hadim-Aladağ) and shallow-shelf (Sultan Daği-Geyik Daği) along the northern margin of the Tauride-Anatolide Platform during the Mississippian.